No conflict here, in fact, the Spymaster came into the employ of Norman Osborn. The original Spymaster was believed to be dead, but the truth is that he faked his death so that he could fade off into obscurity and wait for the perfect moment to return. Osborn uncovered this truth and he realized that the Spymaster was working as a taxi cab driver in New York City. After Norman confronted Spymaster, he requested the former villain's services. He sent the Spymaster to steal valuable personal property of Tony Stark, more specifically, the last known photograph of Stark and his parents. Spymaster was successful, and after he brought the photo to Osborn, Norman burned it. A week later, Osborn returned to the Spymaster's taxi cab only to find that the Spymaster had once again faked his death. The Spymaster faked his death once again and he's most likely off radar. Norman did not see or hear from the Spymaster again while running H.A.M.M.E.R., its uncertain whether or not they'll cross paths again at all. 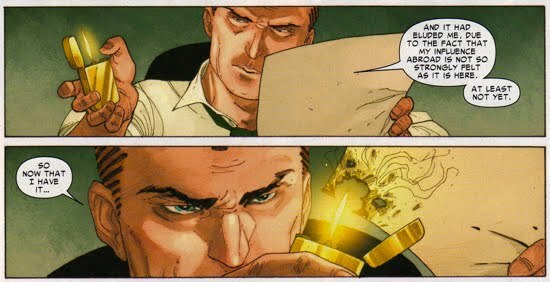 Not much here other than we see that Osborn hates Stark on a personal level almost to the same degree as Peter Parker. Why else would he go through so much hassle to steal a family photo...only to destroy it?